2019 is an historic year for vehicle safety in India. Both four and two wheelers will be subject to new regulatory standards that will transform the safety performance of India’s future vehicle fleet. Anti-lock brakes (ABS) for motorcycles over 125cc, ABS, airbags, speed alert, seat belt reminders and front and side crash test for all new cars together represent a great leap forward for road safety in India. Over the next decade this decisive regulatory action will help reduce the death toll on India’s roads and gives India a unique brand opportunity for global leadership for safer vehicles in emerging markets. The Global New Car Assessment Programme is proud to have contributed to this dramatic turn around in the direction of vehicle safety in India. Our first independent ‘Safer Cars for India’ crash tests released in 2014 generated widespread public interest, and not a little controversy. The zero-star results and stark images of collapsed bodyshells were shocking but they also acted as a catalyst for increased consumer awareness and demand for safer vehicles. Whilst some manufacturers tried to disparage our tests others acted more positively, making air bags standard and trying to improve their crash tests star ratings. This culminated, last December, in Tata achieving the historic milestone of India’s first ever ‘five-star’ rating for their Nexon. And now three and four stars are now much more common in our Safer Cars for India tests, quite a contrast to the status quo five years ago. The Government of Prime Minister Narendra Modi also responded with a commitment to upgrade India’s vehicle safety legislation and now we can see these efforts bear fruit. With pedestrian protection regulations being applied to new models, India has more advanced crash protection requirements than the United States of America! What a great example of global leadership from the fourth largest vehicle producer in the world. And that is why in February this year we were delighted to present to the Indian Government Global NCAP’s 2018 Safety Award recognising their innovative legislative action to improve car and motorbike safety. What we have seen in India since 2014 is a market for safer vehicles stimulated by the combination of increased consumer demand and government regulation. Of course, there is still a long way to go. 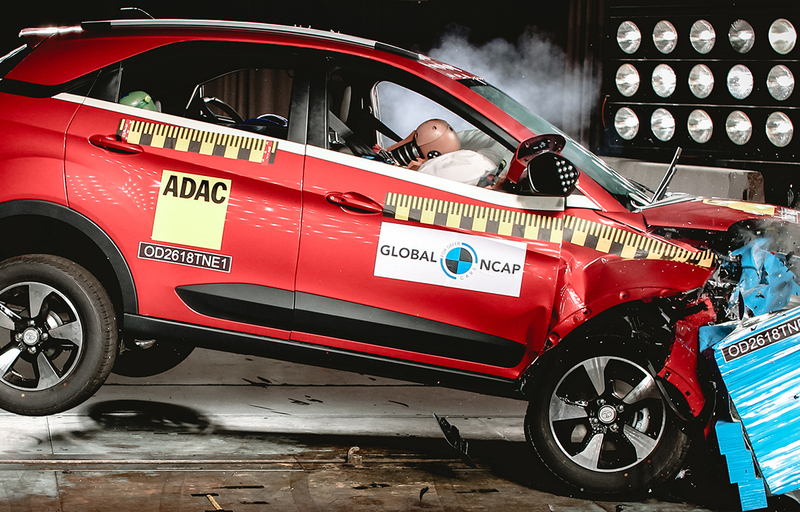 At Global NCAP we hope that more manufacturers will follow Tata’s excellent example and aim for five stars. We would especially like to see a permanent Bharat New Car Assessment Programme take over the role of our ‘Safer Cars for India’ project and include a much wider number of models being tested. A powerful way for the Indian Government to encourage this would be to adopt a mandatory safety labelling requirement. To make any market work well consumers need to make informed choices and that’s why Global NCAP supports safety labelling. In the USA, for example, since 2012 crash tests results are included in their so called ‘Monroney’ label. Named after Mike Monroney, a US Senator from Oklahoma, who pioneered the legislation, the label gives consumers information about safety and emissions performance. (See: https://www.safercar.gov/staticfiles/toolkit/pdfs/window_stickers.pdf). If India adopted a similar label every manufacturer would have to ensure that all their models display a crash rating. From a technology perspective our major priority is for India to accelerate fitment of electronic stability control (ESC). This life saving anti-skid system helps to avoid up to 40% of run-off road crashes and has been mandatory in Australia, the European Union, Japan and the USA since 2012. The availability of ESC in India is still very low at less than 10% of new vehicles compared with an average of almost 80% globally. Having now legislated for ABS, the next step is to mandate ESC and we were delighted that last year Nitin Gadkari, the Minister for Highways and Transport pledged to mandate ESC by 2021. This is a really important commitment and we look forward to its implementation not just for passenger cars but for trucks and buses too. But manufacturers don’t have to wait for regulation, they can voluntarily make ESC standard now. To encourage this, we plan to make fitment of ESC a requirement to qualify for five stars in our ‘Safer Cars for India’ crash tests from the end of 2020. Next year we face some significant milestones as we reach the end of the current UN Decade of Action for Road Safety and establish new goals for 2030. On February 19-20th the 3rd Global Ministerial Conference on Road Safety will be held in Stockholm Sweden – see: https://www.roadsafetysweden.com/). Ministers of Health and Transport from around the world will be gathering to consider what progress has been made over the last ten years and set new priorities for the next. I very much hope that the Indian Government will play a leading role at this important conference. The strong leadership India has already demonstrated on vehicle safety will be a powerful example to other countries. Of course, we recognise that improved vehicle safety is just one part of the complex road safety challenge faced not just by India but all countries. Every day 3,700 people are killed in road crashes worldwide. Carnage on this scale is simply unacceptable. In Sweden next year Ministers will hopefully adopt a new target to halve global road deaths and serious injuries by 2030. But to achieve ‘#50by30’ stronger global action is needed to build safer roads and safer vehicles, used by safer road users. We need a holistic approach that combines improved road management and design with much better enforcement of road traffic rules, and vehicles that minimize the risk of injury not just to vehicles occupants but also to vulnerable road users too. This is certainly much easier said than done, but we know that progress is possible. India has demonstrated that impressively with vehicle safety. Clearly major road safety challenges remain to be tackled, especially to modernise the country’s traffic safety rules and enforcement. That is still unfinished business, but as the improvement in vehicle safety shows, strong public demand combined with committed political leadership can bring progress that was dismissed as impossible just a few years ago. Road safety is a shared responsibility; government, police, industry, city planners, road authorities and the public all have a to play. Working together it should be possible for India to at least halve its road deaths by 2030. And if India can do it the world surely can too. David Ward is President & CEO of Global NCAP.